Got my first bike, which is FZ6 04MY, which had bent rear brake rotor. After replacing the rotor with genuine Yamaha part I’ve noticed that rotor is rubbing on rear calliper’s bracket. Things that were done: mounting surface for rotor on wheel cleaned, calliper bracket cleaned, wheel looks straight, spacers on both ends of wheel installed as per exploded diagram. Old rotor was rubbing only in 1 place. It sounds alot like whatever impact caused the bend of the rotor also caused the caliper pins to bend which would make it be out of alignment. "It is wise to keep in mind that neither success nor failure is ever final." 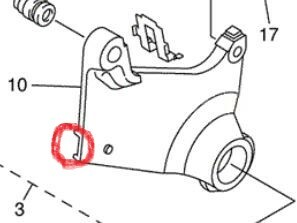 When it was re-assembled, was this (below pic), inserted correctly with the swingarm? If it's not now, or WAS previously tightened down-NOT correctly, that would cause the binding or now, a BENT BRACKET. 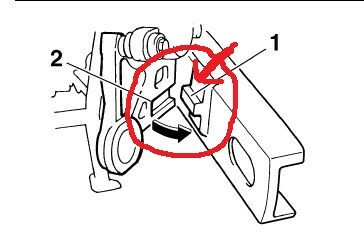 If it's currently in the slot CORRECTLY, THE MAIN BRACKET IS very likely bent and need replacement. It's not uncommon to miss this and ruin the part..
Last edited by TownsendsFJR1300; 02-15-2019 at 05:49 PM. I don't remember if the wheel bushings are different on the FZ6. Could the bushing sizes be different and be swapped? ditto. The caliper itself and or the pins may have been bent in the same incident. You should get this fixed. After your front brakes - rear brakes are the most important thing you want 100% reliable. Last edited by FB400; 02-24-2019 at 02:13 PM. All fixed-used few extensions and a socket on an end to bend calliper bracket-no rubbing any more for about 1.5k miles and rear brake performance seems to be fine.